West African Navies Coming of Age? On 11 February 2016, fourteen Nigerian and Ghanaian pirates in two speedboats attacked the product tanker MAXIMUS (ex-SP BRUSSELS) 70 nm south of Abidjan, Ivory Coast. They hijacked the ship with the intention to steal part or all of its 4,700 metric tonne diesel fuel cargo, sailing it to a position ca. 300 nm south of Lagos, Nigeria over the next few days. The case ended with an opposed boarding of the tanker by the Nigerian Navy, which left one pirate dead and six apprehended; the remainder fled on their support vessel, taking two crewmembers of the MAXIMUS as hostages. What began as just another product tanker hijacking developed into a model case for regional maritime security cooperation under the Yaoundé Code of Conduct. The first asset to track the hijacked tanker was the Military Sealift Command’s expeditionary fast transport vessel USNS SPEARHEAD, stationed in the region for training and exercise support as a part of the African Partnership Station. SPEARHEAD identified the hijacked ship and shadowed it for two days as it sailed from Ivorian into Ghanaian waters. Then the CTF 63, Capt. Heidi Agle, handed over to the Ghana Navy, which continued to shadow the ship until it crossed the extension of the maritime boundary to Togo, about 200 nm offshore at that point. While Benin and Togo were not able to mobilise vessels to that distance from the shore, Nigeria was. 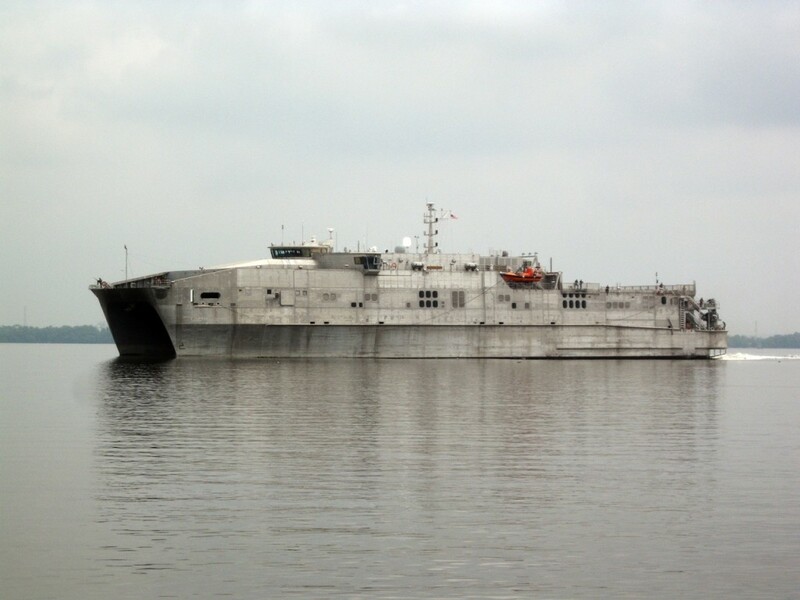 USNS SPEARHED leaving Douala in March 2015 (Photo: Dirk Steffen). On 17 February the MAXIMUS, now re-named MT ELVIS-5 by the hijackers, had reached a position about 300 nm south of Lagos, roughly north-west of the island nation of Sao Tome and Principe. While an unknown mother ship had probably supported the actual attack on the tanker, another vessel, the small Cambodian-flagged tanker DEJIKUN, was likely used by the pirates in an attempt to steal part of the MAXIMUS’s cargo. The DEJIKUN was tracked heading south from Lagos on 16 February, arriving in the general area of the MAXIMUS on midday of 18 February. 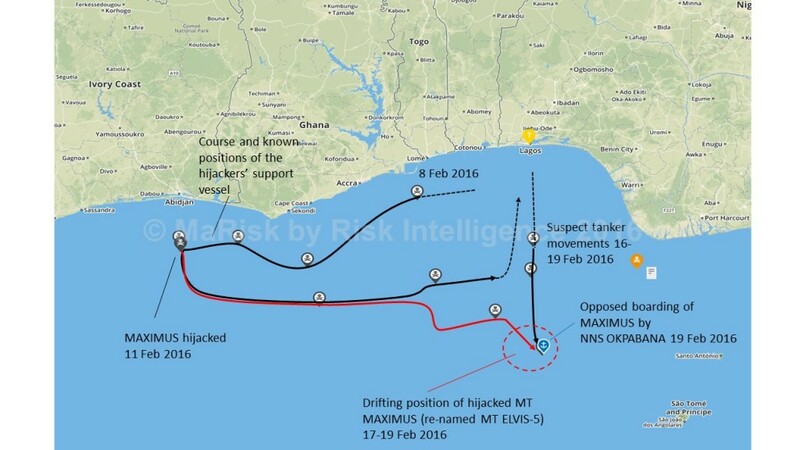 The hijacking of the product tanker MAXIMUS and the tracks of the pirate support vessels between 8 and 19 February 2016 (source: MaRisk by Risk Intelligence). Close on her tail was the Nigerian offshore patrol vessel NNS OKPABANA followed by NNS SAGBAMA. Meanwhile, the Nigerian Navy’s Chief of Training and Operations (CTOP), Rear Admiral Henry Babalola, obtained permission to operate in Sao Tomé and Principe waters although the MAXIMUS was technically in international waters (albeit inside the Sao Tome and Principe exclusive economic zone). What followed on 19 February were eight hours of negotiations via VHF before a Nigerian Navy boarding team from NNS OKPABANA boarded the MAXIMUS in the evening of 19 February. The pirates briefly offered resistance, before one of their number was killed and the remaining six on board the MAXIMUS fled into the engine room where they eventually surrendered. Both from an operational point of view, especially with regards to regional co-operation as well as from a tactical perspective, the mission was a success. None of the MAXIMUS’s crewmembers were injured, although several pirates escaped with two hostages onto the DEJIKUN. The ship was later found drifting off Benin, abandoned by the pirates who had also taken the hostages with them. 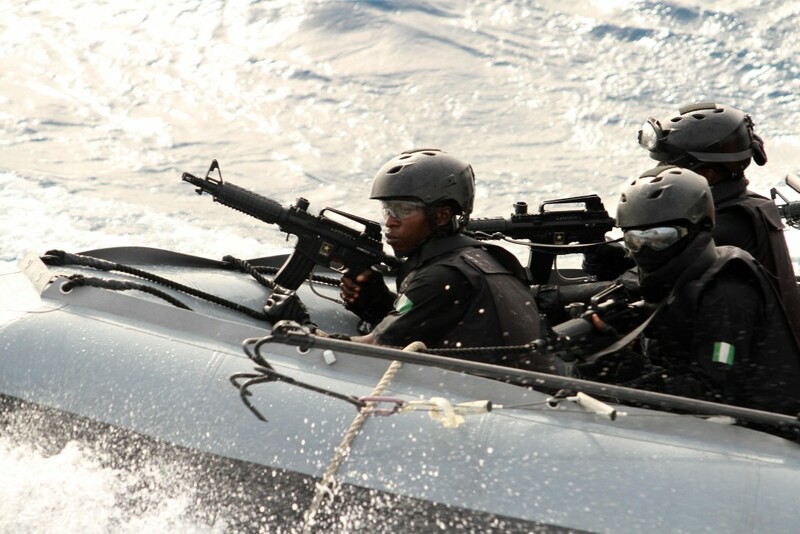 Nigerian Navy SBS team (Photo: German Navy/Steve Back). The liberation of the MAXIMUS was lauded as a model of regional co-operation under the Yaoundé Code of Conduct, even though Sao Tome and Principe, a nation with virtually no maritime security capacity, never reported to Nigeria or to the relevant Zone D reporting centre in the region (contrary to the official statements) when the MAXIMUS or DEJIKUN entered her waters. Nigeria eventually asked for permission to pursue the MAXIMUS into the Sao Tome and Principe exclusive economic zone under a bilateral agreement, which in the end achieved its objective, but also exposed some of the still extant weaknesses in the regional framework and capacities. While diplomatically relevant, the message that the operation sent to the criminals was equally important: Gulf of Guinea states are increasingly willing and able to suppress maritime crime. It may only have been a beginning, but it may well be that the prospect of a forceful naval intervention has upset the plans of would-be tanker hijackers at a time when the economic situation in Nigeria is becoming increasingly conducive to the theft and smuggling of fuel into the country. For the navies of the region, especially the Nigerian Navy, success may become self-reinforcing. The Nigerian Navy has long labored under its dismal performance and reputation relative to its assets and manpower potential. It remains beset by corruption and inefficiency, but it appears that the change that the Buhari presidency has brought over Nigeria may have begun to affect the navy as well. The Nigerian Navy had already responded with some alacrity to the brief hijacking (turned kidnapping) of the LEON DIAS on 29-31 January, the attempted kidnapping of crewmembers from the SAFMARINE KURAMO on 5 February near Bonny River Fairway Buoy and more recently, assisting the BOURBON LIBERTY 251, which had two crewmembers kidnapped on 23 February 2016. 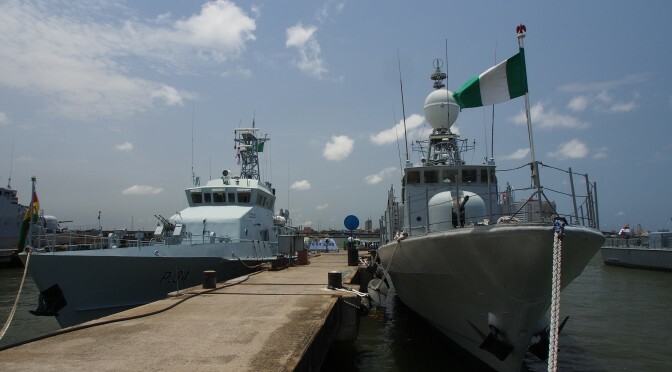 In all cases, the Nigerian naval vessels arrived well after the attacks, although in the case of the SAFMARINE KURAMO the attackers had to abandon their attempt to extract the crew from their citadel and were forced to leave the ship. While not entirely satisfactory to those involved, it is progress over previous years. Before, the navy hardly ever responded to distress calls at all, and when they did, it more often than not created bad blood between them and the merchant marine community through heavy-handed practices. Dirk Steffen is a Commander (senior grade) in the German Naval Reserve with 12 years of active service between 1988 and 2000. He took part in exercises OBANGAME EXPRESS 2014 and 2015 both at sea and ashore for the boarding-team training and as a Liaison Naval Officer on the exercise staff. He is normally Director Maritime Security at Risk Intelligence (Denmark) when not on loan to the German Navy. He has been covering the Gulf of Guinea as a consultant and analyst since 2004. The opinions expressed in this article are his alone, and do not represent those of any German military or governmental institutions.